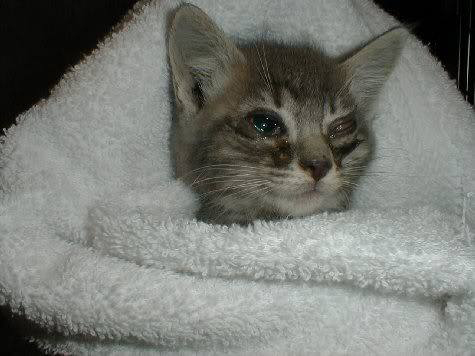 I’ve done feral rescue for years and have probably rescued several hundred kittens, many with respiratory infections, eye disease and other ailments. I would estimate that between my dogs and rescues, I have saved thousands of dollars in vet bills & Dr’s, just by researching on alternative therapies, as well as with my own injuries, as the majority of those years I was without health insurance.My last four little rescues – I have been bottle feeding and although they are perfectly capable of eating kitten chow – they sit and cry for the formula, and I am a sucker for these little ones. One of the little girls, I noticed was scratching her neck and after looking at it, noticed the hair was gone, as well as it was very inflammed and her entire neck area was severely enlarged. As I was giving her a spray bath, with the Dr. Bronner’s Baby Mild Castile Soap, a little of the Honey Scrub Face Wash added, I noticed a few very small puncture wounds. After drying her off, I applied a small amount of pure Castor Oil and gently dabbed over the wound – & put her in single crate, with no litter, as I did not want her to become more infected.The next day, the puncture wound was now completely open (to the size of a pencil eraser) , as well there were a couple of smaller punctures that had opened up. I began gently applying pressure around the wound and it began draining out- to put it bluntly pus from the infection. Each time, I would clean with a little Honey Wash on a homemade baby wipe and then apply the castor oil again. I continued daily to massage and push toward the puncture to help expel all infection. Yesterday was the fourth day – and her neck is completely healed and the puncture wounds have closed up overnight. The neck is normal size and she is again with her friends. Antibiotics were not an option, as I could not get them down her. This is a powerful oil and one that Edgar Cayce wrote about extensively, as well as in my favorite book of all times “Vermont Folk Medicine” by Dr. D. C. Jarvis, written in the 50’s. A medical doctor who writes of the thousands of his patients and the miiracles of Castor Oil, Honey, Kelp, Apple Cider Vinegar. You can find on Amazon and it’s such a great read. Click here to read my article on the kitten who had the hard growth on her face – and what happened after applying Castor Oil – it’s almost unbelievable.